At just $89.99, the TaoTronics Sound Bar has been a best-seller on Amazon for months now. Since it offers a sleek design and sound quality that rivals units two and three times its price, it’s not difficult to understand why. But did you know that TaoTronics also makes an upgraded version with ever better sound and an even sleeker design? 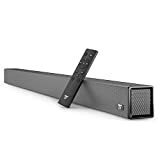 The TaoTronics 40 Watt 4-Speaker Sound Bar has a full retail price of $199.99 and it’s worth every penny. But if you grab one soon, you’ll only pay $99.99!